Pete Connock and Martin Phippard of CP Productions have recorded the movement of four exceptional loads by Friderici, Diamond Heavy Haul, Plant Speed and Brame P. The filming is detailed and the narration full of good information. Friderici, operating in Switzerland, is shown transporting massive wind turbine sections from the port of Basle to the highest point on the Jura Mountains. Mercedes, MAN and Iveco units hauling Nicolas, Broshuis and Faymonville trailers undertook this challenging journey. 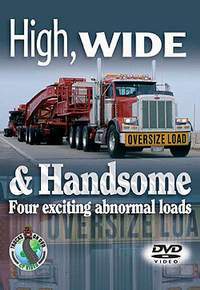 In America, Ohio-based Diamond Heavy Haul was moving one of its more spectacular loads. The huge casting was hauled out of the port of Indiana, offering the sights and sounds of Peterbilts, loud Jake brakes and a DHH powered trailer. The British haulier Plant Speed operates sophisticated Volvo FH 16 8x4 tractor units to move the heaviest loads. CPP was fortunate to catch one of these moving a twin-hull ferry in the Lake district from Keswick to the port of Workington. French transport specialist Brame P regularly moves heavy loads from Belfort to the port of Strasbourg. CPP captured the unusual sight of two massive loads each with a tractor unit at the front and a 'pusher' at the rear!